Claddagh National School is rightly well-known for its strong tradition of music. As well as teaching the Music Curriculum, we are especially proud of our famous Claddagh School Band and our School Choir. We also run the Colour Strings Music Programme in the school, and are always on the look-out for other ways to enrich our children's experience and appreciation of music. We are privileged to have our music programmes run with energy and talent by Rosemary Ledwith and Ruth Randles. When it comes to performances, we would be lost without the remarkable talents of both Chris Kelly and Yvonne Fahy. The mighty Claddagh School Band has been going strong for over 40 years, and shows no signs of stopping yet! With its annual performances in the Galway St. Patrick’s Day and Oyster Festival parades, the Claddagh School Band has entertained hundreds of thousands of people over the years, and become one of Galway’s best-known marching bands. In 2016, the Band became the first in Galway to stage a Hallowe’en parade – with our “Mini-Monster Music March” in aid of the Irish Cancer Society. Between musicians, majorettes, flag-bearers and art-group members, our Band has a place for all of the children of Claddagh School. Participating in the Band provides our children with a unique combination of musical skill and marching co-ordination. Perhaps most importantly of all, though, being part of this superb musical team builds and reinforces a strong sense of community and pride in all of us – children and adults alike. 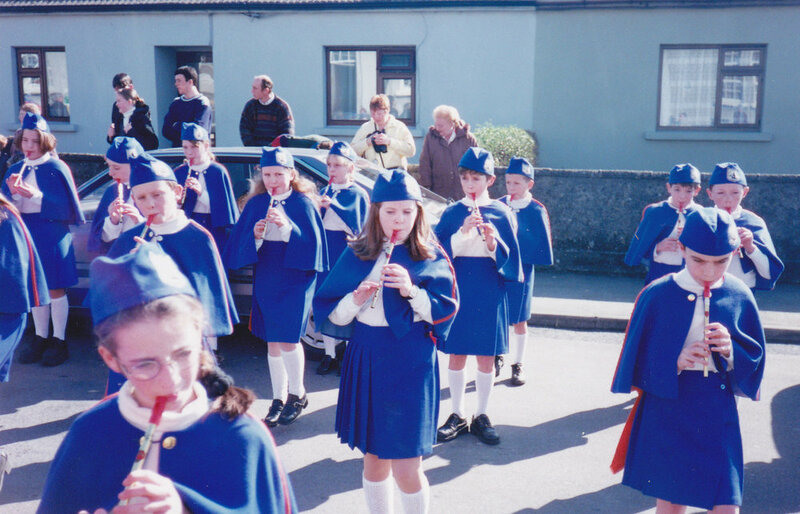 Year after year, past-pupils remind us that marching proudly behind the Claddagh School banner – either practising around the streets of Claddagh, or parading through the centre of Galway – remains their fondest memory of Claddagh School. The Claddagh School Band represents one of our proudest traditions, and we look forward to many, many more days out in the future. Our School Choir has, in recent years, grown in ability, reputation and repertoire. Our choir members are chosen from 3rd to 6th class. It is a voluntary after school activity which takes place once a week throughout the school. It is a fully inclusive choir where all are welcome. The children enjoy singing many genres of musical tastes, naming but a few songs, Leaving of Liverpool, Mr. Blue Skies and Blackbird. Over the years, we have performed at many events and venues across the city, including St. Nicholas’ Collegiate Church, Meyrick Hotel, the opening of the Galway Continental Christmas Markets and festive singing in UCHG. We have also recorded numerous songs celebrating various events, i.e. our 8oth anniversary, 1916 commerative song and a composition entitled, Europe through my Eyes, in collaboration with other countries. The children enjoy performing and participating in these occasions, both in and out of school. Being part of such positive and enriching experiences enhances their confidence and self-esteem. They develop lasting friendships through the common bond of music.